Many of Magnum inverter / chargers come in 12, 24, and 48-volt options. And Magnum have added easy-to-install panel systems with our MMP (Mini-Magnum Panel) and MP (Magnum Panel) lines. Look for our state-of-the-art battery charger design, using power factor correction techniques, an innovative first in both our sine wave and modified sine wave platforms. The MS-PAE 120/240V Series Inverter / Charger from Magnum Energy is a pure sine wave inverter designed specifically for the most demanding renewable energy applications. The MS-PAE Series is powerful, easy-to-use, and best of all, cost effective. 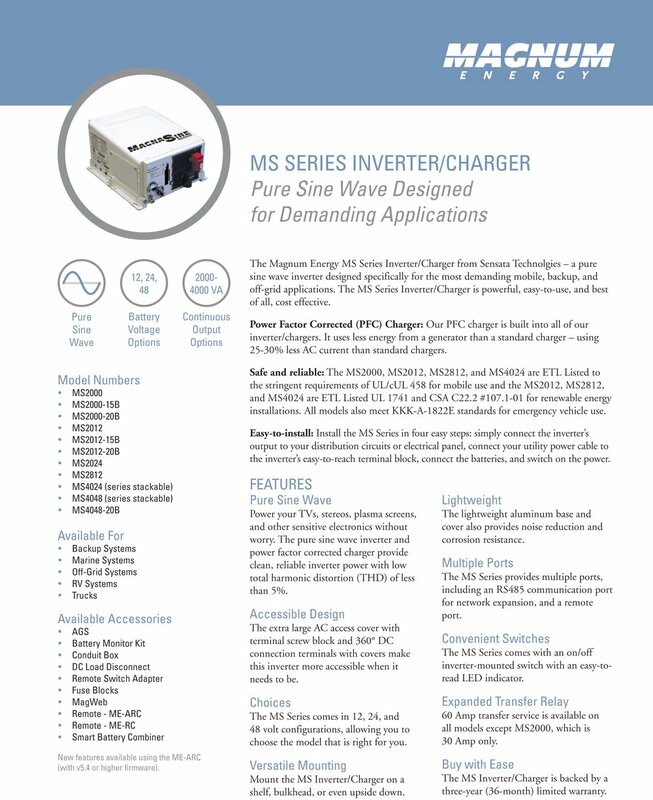 The MS-PAE inverters are stackable — multiple inverter/chargers can be combined for increased output making it suitable for small and large power requirements. 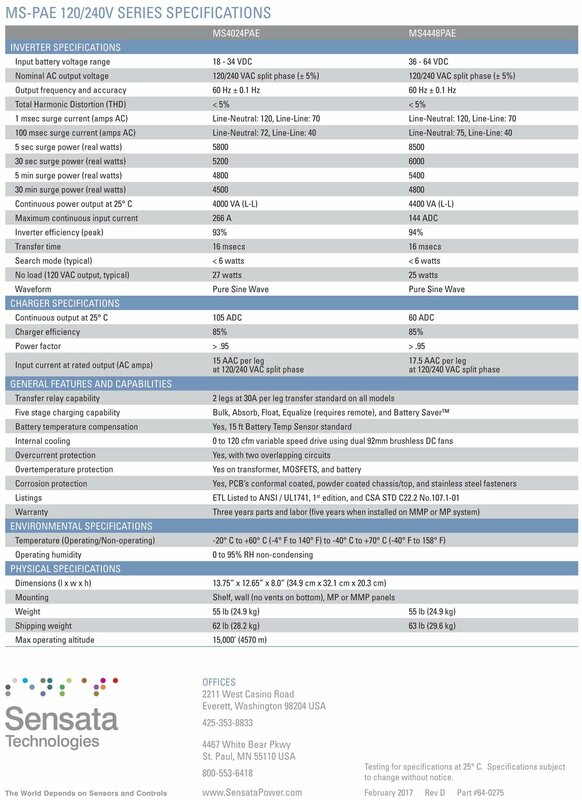 This is our most popular inverter for off-grid cabins, homes and battery backup systems. 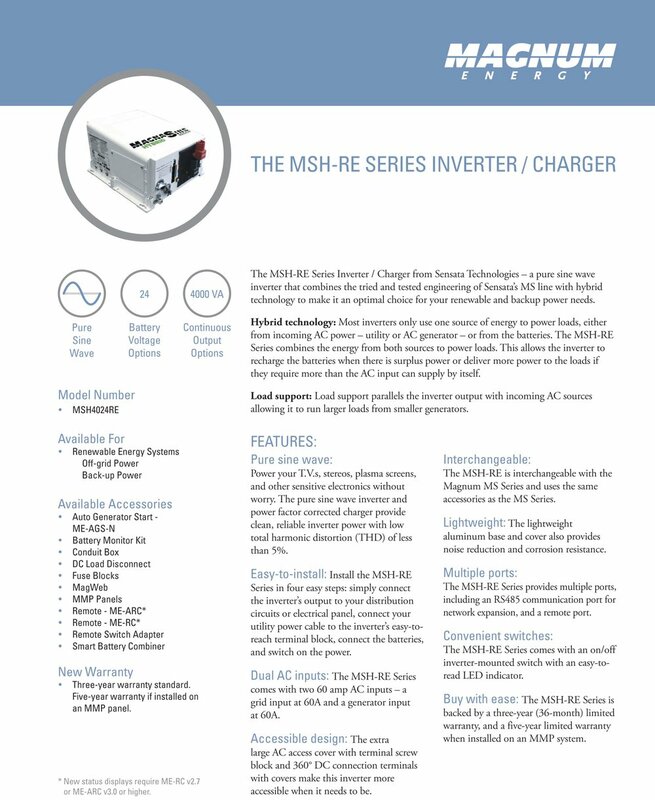 MS-PAE inverter/chargers include a 3 year warranty which is extended up to 5 years when installed on a Magnum panel enclosure. The MSH-RE Series Inverter / Charger from Sensata Technologies – a pure sine wave inverter that combines the tried and tested engineering of Sensata’s MS line with hybrid technology to make it an optimal choice for your renewable and backup power needs. Hybrid technology: Most inverters only use one source of energy to power loads, either from incoming AC power – utility or AC generator – or from the batteries. The MSH-RE Series combines the energy from both sources to power loads. This allows the inverter to recharge the batteries when there is surplus power or deliver more power to the loads if they require more than the AC input can supply by itself. Load support: Load support parallels the inverter output with incoming AC sources allowing it to run larger loads from smaller generators.